Working with variables and text fields to build a pie chart – How can we help you today? Variables work in conjunction with other components to add interactivity to a Klip. 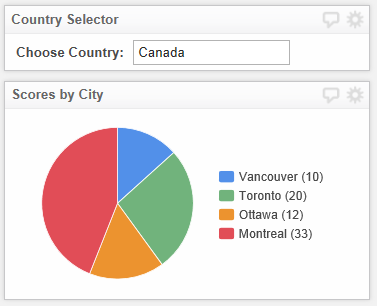 This example shows you how to create a pie chart of city scores by passing a single variable and using a text field to specify the country name. Although this example use the pie chart component, this concept can easily be used with other Klipfolio components. Goal: Create a variable to use with a text field. Select Don't use a data source option. From the component tree, select Klip, and type a Klip Title. For example, Country Selector. Control Type Select Text Field. Goal: Use the SELECT function to create the labels and values sub-components. Select Use an existing data source from the library option. From the component tree, select Klip, and type a Klip Title. For example, Scores by City. Tip: You can also create the Labels select statement by copying and pasting the Values select statement using the keyboard combination of Ctrl+C and Ctrl+V. However, remember to change the column reference from column C to column B. You can test a variable you have already created. In the user input control component, select the variable you want to test, and in the Klip Editor Value box, type in an expected value. For example, Canada.